I always have WAY more ideas than I have time to implement, even if I live to be 11.000 years old. And to think my biggest fear when I started first writing articles back in 2005 was that I’d run out of topics to write about. * What annoys the CRAP out of me in about 99% of the articles or tips I read that are meant for introverts – and what I believe is MUCH better to focus on instead. And how it’s TOTALLY possible for EVERY introvert entrepreneur to thrive BECAUSE you are an introvert – not in spite of it. Then there are the ideas I have for master classes; new programs; freebies; the book I’m currently working on; the three books I already KNOW I’ll write after that; and some other books I may or may not write some day. But the ideas are there! In articles I write; updates on Social Media; fun programs and challenges in the Divinely Selfish Community; etc. Usually, I LOVE living in a state of almost constant inspiration. But sometimes, it overwhelms me. And I don’t know where to start or what to share first. And there have been times this totally paralyzed me, and I ended up sharing and creating nothing at all. You may recognize that too. How there’s SO much you want to do that you run around like a headless chicken and end up doing….nothing. How there’s so much you want to say in one article that you can’t fit it all in, and you don’t even start writing it. How there’s so much you want to teach in one program that it gets bigger and longer and it becomes so complicated that you ditch the entire program idea all together. How you’d love to deliver a workshop or retreat, but the thought of all the different parts you need to work on (the content! the marketing! the selling! what to wear! where to host it! etc!) that you end up not offering it ever. Today, I felt that overwhelm creep up on me again. I looked at those article ideas I mentioned above, and wondered which one to write first. None of them called me. And ALL of them have inspiration in it I KNOW will benefit you, too. The ONLY thing I knew for sure, was that I felt like writing a fresh article for you today. Dropped into my heart and out of my head. What do I FEEL like writing about now? What wants to be expressed through me right now? What will benefit the people reading this article MOST right now? That’s when the idea for this article came up. And I sat down and wrote it in 30 minutes or so. Drop into your heart and out of your head. What do you FEEL like doing or creating now? What wants to be expressed through you right now? What will benefit your audience MOST right now? And if you STILL don’t know? Or go and do something COMPLETELY different. 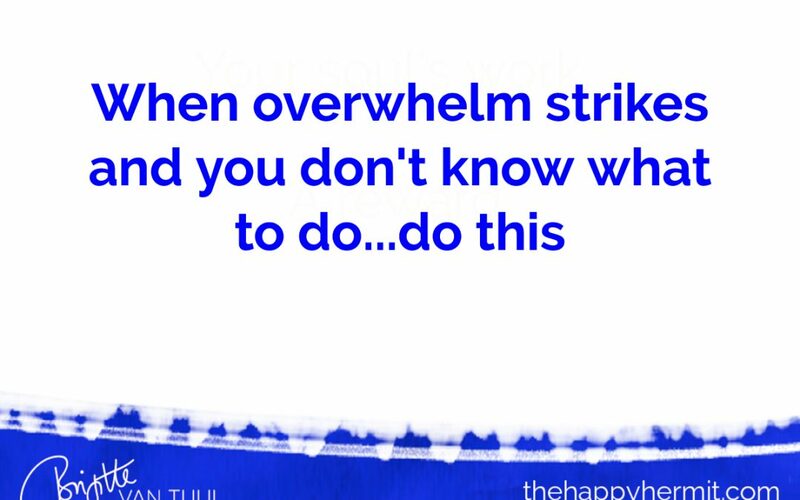 Overwhelm can only survive when you stand still. It disappears the moment you start moving – in WHATEVER direction, taking WHATEVER action. PS. : The 7-week program ‘Finish That Thing – 7 weeks to finish your project / idea / book / creation before Christmas’ started this Monday! If you want to finish something THIS YEAR, and you can use some inspiration, support, accountability & cheering on: this is for you! We only just started and you can easily jump in now. It’s all happening in the Divinely Selfish Community. The women who are already in are working on some pretty cool things – and I’d love to support you in finishing YOUR cool thing or unfinished business too! Check it out here & sign up if it resonates.